After a comprehensive work on creating a questionnaire with relevant issues included, partners launched the survey “Are you familiar with your labor rights” in order to provide a relevant field analysis and define the greatest challenges young workers are facing with. Research will offer a national overview (which is of particular importance, having in mind the lack of specific data on this topic that would serve as guidelines for further action), as well as a regional cross-section, defining similarities and differences between countries in the region, but also making a parallel between the situation in the EU member states and those countries who are still preparing for the membership. Results of the research will be the starting point for all further activities within the project, which aim to improve the awareness of young people about their rights in working environment, in order to empower themselves and to improve their working standard. Focus of the research is on young people under the age of 35, employed in public administration. Research is carried out by the Center for Advanced Studies of the South-East Europe at the University of Rijeka, with the support of the trade unions of administration and justice involved in project implementation. 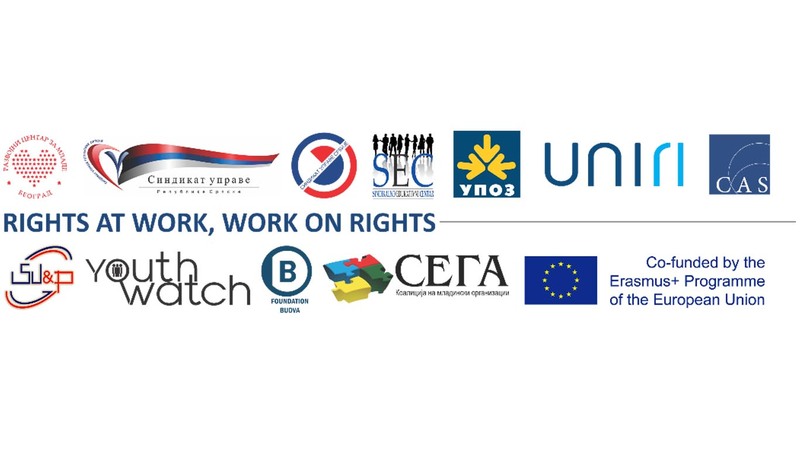 Research is part of the project “Rights at work, work on rights”, which is supported under the Erasmus + program of the European Union: KA2 – Capacity Building in the Field of Youth / Western Balkan Window. If you are a young person employed in the public sector in the Republic of Serbia, we invite you to visit the following link and share your opinion with us, because it is really important for us!